It wasn’t that anything was wrong with the old covenant, other than those of us that were trying to live by it. The old covenant was justice. We got what we deserved. We obeyed the laws of Moses, or we paid the price of sacrifice. If you did not seek atonement, punishment came. Isn’t that what we want for mankind now? A young man kills in a fit of rage, and we seek justice by calling for his death. A drunk driver kills an innocent family, and we seek to see him spend the rest of his life in prison. It’s an eye for an eye and a tooth for a tooth. Justice works for our satisfaction. We want punishment for those who fail the law. That is…until we’re the ones on trial. Then we want mercy. The problem is, we all need mercy, for none of us can keep the entire law, and therefore are guilty of the whole law in God’s eyes (James 2:10). That’s what the new covenant is really about, mercy. God came near. He sent His Son as a child, a newborn, conceived by the Holy Spirit, born of a virgin, raised as the perfect man Jesus, yet convicted and crucified for our sins. Jesus did not receive justice. Instead, He gave. He sacrificed His life for ours. Why? Because He saw that we needed mercy. We needed righteousness that in and of ourselves could not be obtained. It’s not about justice. It’s about grace. It’s about love. It’s about His love for us being more than His love for Himself and His son. He gave. He gave the ultimate sacrifice because He gave of Himself. He gave more than we could ever deserve, which is good will toward man, creating peace on earth between God and man. HE GAVE. He gave sacrificially. He gave mercifully. Today is the day to share His gift. Tell others what He has done for you, which is the greatest way to deliver the gospel of Jesus Christ. It is a gift greater than anything you can package and put under a tree. 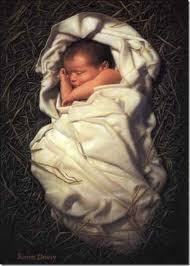 Thank you, Father God, for the Most Perfect Gift, your Son Jesus. Thank you for our Savior, our righteousness through Him, and our guidance through Your Holy Spirit. Thank you for peace on earth between man and yourself, through grace and the new covenant of Jesus Christ.